A fresh breeze is always within reach with a Renewal By Andersen of Southeastern Mass and Rhode Island awning window. Ideal for above kitchen sinks or wherever opening a window may be difficult because of distance, awning windows are operated by turning a crank to gently open to let in cool air. A touch of elegance comes standard with each awning window adding a new dynamic to the room with supreme ease. For a more energy efficient option, choose a stationary model to enjoy the view and the savings. Awning windows are similar to casement windows, but hinged at the top. They swing outward to provide ventilation without the risk of allowing rainwater to penetrate into the home. You will be able to brighten your guests’ moods as light streams in through your new awning window without having to worry about inclement weather. Each model of Renewal awning window we install allows the air in from any angle for fresh scents and fresh minds. Here is a list of each model we install. To learn the full details and to find out which model best fits your needs, call us or request a quote to schedule an appointment with our local window experts. 100 Series: Enjoy all of the benefits of awning windows without emptying your wallet. This affordable model is comprised of our Fibrex™ material to provide your kitchen with light and air for years to come. 400 Series: Natural pine interiors accent your rooms in subtle fashion while Perma-Shield coating protects your home from water damage. Let in the Spring scents while leaving the dust and pollen outside. A Series: Eleven exterior colors, natural oak, maple, or pine interiors, and customizable frame and sash combinations allow you to choose the proper aesthetic style for your kitchen. Don’t let the distance come between you and what lies outside. While Spring showers patter lightly against the pain, your home will smell fresh and clean without water invading. Rays of light will brilliantly brighten your kitchen while you prepare a meal or rest admiring the scenery. When you choose Renewal by Andersen of Southeastern Mass and Rhode Island for replacement windows in the Fall River area, we’ll provide side-to-side ventilation and pleasant views through the seasons. 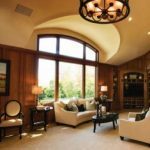 Awning windows can be easily paired with another of our traditional window styles to form a bay or bow window. To learn more about our full selection of window styles, to visit our Windows page. To schedule your in-home consultation with our local window experts, call Renewal by Andersen of Southeastern Massachusetts and Rhode Island today!